Recently a friend posted this frustration with the system that supposedly keeps car stereo thieves from using a stereo. Unfortunately, it kept the owner from using it as well. Driving home last nite suddenly the dash lights up like an xmas tree. Lights turn off, alarms go off, etc. Climbing partner & I: “This is not good”. 1/2 second later everything’s normal. Next time I start her up: no radio. It just says: “code”. No tunes in my car. She’s a wonderful car; gets 26 MPG and will run down almost anything. But WHAT CODE! Where do I find the CODE?! Q. Where can I find the radio code if I don’t have it? A. First check your radio manual to see if the code has been written in it. If not, contact your local BMW dealer. With your radio serial number (for Harman Kardon units see the volume question below, otherwise, you may need to pull out the radio) and VIN they should be able to look up your radio code. I think this is an interesting study in the ratio of security offered to user time required. It’s going to take Luke some trouble to get his radio working, but he can rest easy that if it is stolen the thieves won’t enjoy it! Well, unless they grab the radio manual when they steal it and the code is written there. It reminds me of the anti-copying security that frustrates many users when their legitimate copy of something is suddenly taken from them by mistake. I have heard the argument that, as a user, it makes more sense to steal because then what you own cannot be repossessed by mistake when it has no copy protection. The situation is also evidence that the study of signal detection should be alive and well in industry – BMW certainly chose time consuming consequences for a false alarm. 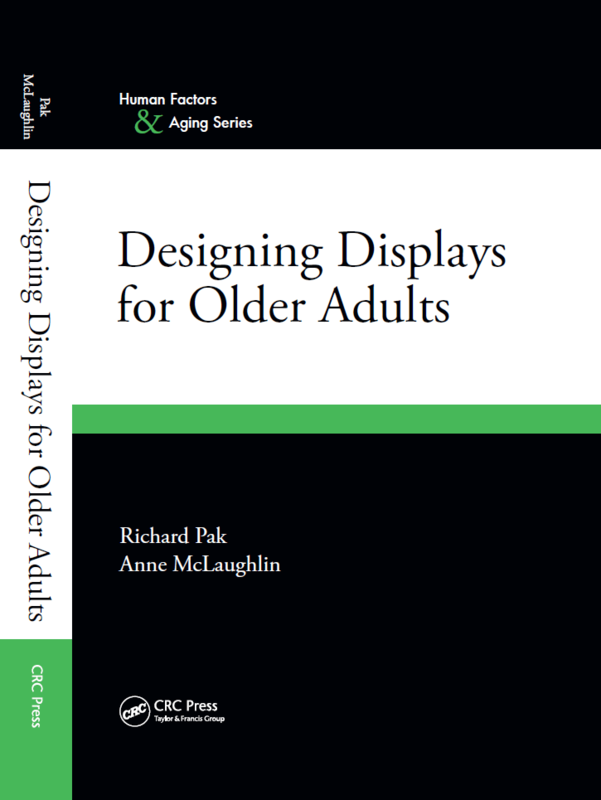 After a long process and over a year of work, Anne’s and my book on user interface design for older adults is almost available! The cover of our book has been finalized (shown below). The book will be released September 21st, 2010 and will be available where fine books are sold or directly from our publisher CRC Press. We’ll give away a few copies of our book and in a future post provide an excerpt when we get permission. Unfortunately, the book is not scheduled to be available in electronic format but we hope that will change. An ebook will also be available (thanks Peg!). A distillation of decades of published research, this book is a primer on age-related changes in cognition, perception, and behavior organized into meaningful principles that improve understanding. It explores the complex set of mental and physical changes that occur during aging and that can affect technology acceptance, adoption, interaction, safety, and satisfaction. The authors apply these theories in real design exercises and include specific guidelines for display examples to bridge theory and practice. It opens the way for designing with an understanding of these changes that results in better products and systems for users in all life stages. Here in CA there is a big to do over the shooting death of a young man (Oscar Grant) by a BART police officer Johannes Mehserle. Apparently, Mr. Grant was being detained by Mr. Mehserle. At some point Mr. Mehserle felt that Mr. Grant needed to be tasered (tased?). The police officer drew his weapon and fired, killing Mr. Grant. Mehserle had drawn his pistol instead of his TASER. As you can see [ed: example taser on right] it is remarkably like a pistol in design and form. I came across two examples of human factors angles in health care. The first is from the NPR show Planet Money. The show focuses on how much inefficiency and waste there is in medical billing. The whole podcast is worth listening to, but there is one bit that made me laugh out loud (fast-forward to 10:35). Three easy steps to a leaner NDC number. First, if the NDC number begins with a 0, drop the 0, use the next 8 digits, disregard the last 3 digits. If the leading digit is not a 0 but the 6th digit is a 0, use the first 5 digits, drop the 0, use the next 3 digits, disregard the last 2 digits. There are two bins of each item; when one bin is empty, the second is pulled forward. Empty bins go to the central supply office and the bar codes are scanned to generate a new order. The hospital storeroom is now half its original size, and fewer supplies are discarded for exceeding their expiration dates. The system is just one example of how Seattle Children’s Hospital says it has improved patient care, and its bottom line, by using practices made famous by Toyota and others. The main goals of the approach, known as kaizen, are to reduce waste and to increase value for customers through continuous small improvements. The program, called “continuous performance improvement,” or C.P.I., examines every aspect of patients’ stays at the hospital, from the time they arrive in the parking lot until they are discharged, to see what could work better for them and their families. Standardization is also a C.P.I. cornerstone. Last year, 10 surgeons at Seattle Children’s performed appendectomies, and each doctor wanted the instrument cart set up differently. The surgeons and other medical staff members used C.P.I. to come up with a cart they all could use, reducing instrument preparation errors as well as inventory costs. I can’t comment on CPI or the benefits/costs of such an implementation, but I would be very disoriented if someone made me standardize my office or desk! Final point, just from what I gathered in the article, CPI seems to harken back to time-motion studies of Frederick Taylor. Good or bad? HF/Usability Potpourri returns with two recent items. Reports from some sites suggest that at least some of the cellular reception issues of the new iPhone 4 are due to improper display of signal strength. This is a neat HF issue because it involves user’s trust in automation (the display of reception bars is actually a computed value, not a raw meter of actual signal strength), the design of information displays, and properly informing the user so they can set expectations. Apple is planning to tweak the way in which those bars get calculated (presumably to be less optimistic) to bring user expectations in-line with reality. 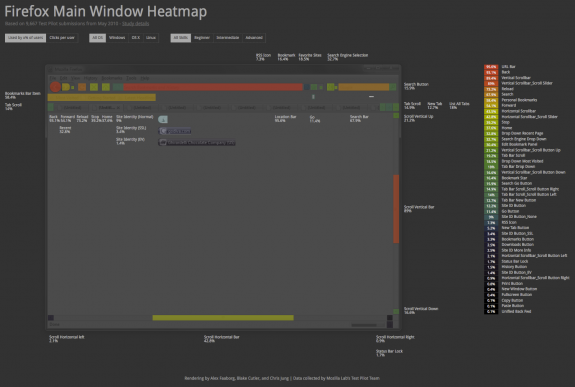 Next, Mozilla, creators of Firefox, present some interesting visualizations of what users are clicking in Firefox. As expected, the back button is one of the most frequently clicked items (93% of all users). Interestingly, the RSS icon in the location bar (the orange square icon used to subscribe to blogs) showed some operating system differences. Five percent of PC/Windows users clicked it, 11% of Mac users, and about 14% of Linux users. Indicative of experiential differences? PC users less aware of blogs/blog readers?